Two prominent men, one the World’s Richest according to Forbes and the other, one of the highest paid Hollywood actor and the most recent recipient of Oscar’s best actor award, have something in common. Bill Gates and Leonardo DiCarpio are campaigning hard to save the world from climate change. Gates in his annual letter, stressed that it has been more than a century since Thomas Edison, invented the light bulb and yet, a big chunk of the world’s seven billion population live without electricity. In the sub-Saharan Africa alone, 70 percent live in the dark while there are roughly 300 million people in India without electricity. And it is his wish to see the poorest of the poor have access to power, saying that they would be driven further into poverty and likely to suffer the most with the effects of climate change. Of course, we already see the points of Gates. In our country, the poorest of the poor are the farmers and the fishermen. Data from the Philippine Statistics Authority shows that the fishermen and farmers in 2012 posted the highest poverty incidence of 39.2% and 38.3% respectively. These fisher folks and farmers are the ones who use kerosene lamps at home, too. And unfortunately, the farmers are also the ones suffering from this round of El Nino, The Department of Agriculture has recently reported that damage to crop due to the drought already reached P4 billion. However, Gates, a known philanthropist, does more than lament the lack of electrification in parts of the world and the possible effects of climate change on the poor. After learning that the world must eliminate carbon emission at the end of the century, he did the math and came up with an equation to drive carbon dioxide to zero. According to Gates, the way to zero CO2 is to have a zero on any of the variables. Unfortunately, one cannot have zero for services and energy needed to provide the services. This means that our greatest chance of producing zero carbon dioxide is to have a value of zero for C.
What does Gates propose to do to keep C at zero? His proposed solution is to find ways for solar and wind energy to provide energy 24/7. But he also recognized that this is quite challenging since so far, the solution to having these power supply constant is battery storage, which unfortunately now remains expensive and could increase the cost of electricity as much as three times. Now, how does he think we can harness the wind and solar energy that can power for 24 hours? This is where he issued an energy challenge, asking for solutions on how wind and solar energy can be made available at any time of the day at low prices. In fact, he has already funded the research for this. And he is probably right. There have been significant progress in technology. For example, recently, Amber Kinetics introduced its multi-hour flywheel battery storage solution, which acts as a reservoir for kinetic energy. The high-speed rotation of its steel rotors lets the system store power that can be drawn out as needed. This cutting edge battery solutions is very handy these days. DiCarpio, after all, is a staunch green advocate. His foundation is giving away some $15 million in grants to various organizations involved in finding innovative ways to save the environment. Plus, he is also a United Nations envoy on climate change and has recently inked a deal with Netflix to produce non-fiction documentary and docu-series on the environment. That’s the world’s richest and one of the best Hollywood actors who are putting their money to save the environment and telling us to do the same. Plus, there’s also Pope Francis with his landmark encyclical on the environment and climate change. Now, who else do we need to tell us that it’s time to roll up our sleeves and get ready to work and shift to renewable energy before we start taking more action? At the forum with Sen. Loren Legarda, IFC Country Director Jane Xu, Former Energy Usec. Atty. Jay Layug and UPLB Chancellor Dr. Fernando Sanchez Jr. I have always been vocal in my belief that everyone should have equal and unfettered access to God’s gift to us – our environment. On the other hand, we all have the responsibility to take care of our environment and more importantly, to know how to tap the richness of this gift to us. We have to learn; we have to be educated about these things. That is why I was glad, we at the College of Economics and Management Alumni Foundation Inc. (CEMAFI), was able to host with the International Finance Corporation (IFC) of the World Bank a forum with the theme “Making Renewable Energy a Vehicle for Sustained Inclusive Growth. It was a daylong event attended by energy players, members of the academe and bankers, and moderated by former Energy Undersecretary Jay Layug. The event was held at the IFC’s office in BGC last February 26, 2016. Tapping our environment and produce renewable energy is one of the key drivers of economic growth. This is a concrete way of exercising this belief in our inherent right to use responsibly our environment.And I am not alone in saying this. In fact, a recent report by the International Renewable Agency (IRENA) said that increasing the energy mix to include more renewable energy could mean a global economic boost of as much as 1.1 percent by 2030. But again, more needs to be done when it comes to developing renewable energy in the country, including relaxing foreign ownership restriction, shifting to a more appropriate tariff mechanism scheme that calculates for the risks of the developers adequately, and a review of the recently implemented CSP, to name a few. And it is for this reason that I am helping my alma matter, UP Los Baños through our alumni association, UPLB CEMAFI–of which, I am the president–become more proactive in developing renewable energy through various initiatives. One of the speakers was Senator Loren Legarda, a staunch advocate of green energy in the Senate. During the open forum, Sen. Legarda heard the travails and challenges of developers. She was particularly surprised that the 12% import VAT was obviously very unpopular among the developers. IFC Philippines Country President Jane Xu emphasized the need for the country to invest more in renewable energy given that the Philippines is the fourth most disaster-prone country in the world according to UN. She emphasized IFC’s commitment to support the renewable energy sector. And I fully support UPLB’s drive to contribute more to the renewable energy sector. Not only because I love my Alma mater, but also because it is my belief that it is time to bridge the divide between the academe and the problems facing the sector in the real world. What do I mean by this? It is my observation that the academe is detached from the sector: that there are gaps in the real world today in the renewable energy sector that the academe yet and can best address. For one, no single institution is credible and can provide an independent opinion on RE resources. Renewable energy developers rely heavily on foreign consultants, which has cost implications. The lack of information and competence locally serves as an entry barrier for small RE players. And this is where the academe can help. In the right intellectual way, the academe can lead the way in lowering that entry barrier, something that the UPLB can offer as a service to the sector. The university too can benefit if it beefs up its competence in generating RE data since the school can charge fees for this information. We at CEMAFI has taken the responsibility of finding more funds for research to attract more professors to do extensive research. In fact, we have already established the UPLB’s Rural Economic Development and Renewable Energy Center years back. Generating data and selling them for a fee will make the center more self-sufficient when it comes to funding while helping the local RE players. And this is why, together with our alumni association, we are working together closely to help UPLB meet its objective of “making renewable energy a vehicle for sustained, inclusive growth,” the exact words of Dr. Sanchez during the forum. The recently held forum is just the start of the many initiatives since we recognize that more is needed to develop the sector. We will have more conferences in the coming weeks, as well as other initiatives to help address the obstacles to achieving the sector’s full potential. It might be a bit late (almost two months after the start of 2016), but here is my wish list for the local Energy sector. At the risk of sounding like a broken record, it’s time for our lawmakers to review and carefully understand the implications of restricting foreign ownership in the renewable energy sector. Climate change is global problem – therefore, there should be a global collaboration in addressing this problem. We are aiming for a better energy mix consisting of higher energy sourced from renewable sources. However, there are few local businessmen who can shell out the capital needed to put up renewable energy plants. The country’s goal is to increase our renewable energy capacity to 15,400 MW by 2030. We can focus on limiting the foreign ownership of the resource e.g. the sun, the water resources, wind, and others. The ownership of the equipment we need to convert these resources to energy should be opened up to foreign ownership. After all, we do not have these technologies. I wrote extensively on this item last year. The problem lies with our energy planners as they favor the least-cost method, choosing the cheaper energy source based on current prices in energy planning. Again, the least-cost method does not consider risks such as the volatility of oil prices. In the beginning, it may seem cheaper to put up a fossil fuel-based plant. But again, what happens when oil prices spike? Oil prices are down these days, but who knows when and by how much the uptick will be in the future? Businessmen prefer predictability, and this has a cost. For our energy planners to review the use of Capital Asset Pricing Model (CAPM) in computing for tariff setting. Again, this is one topic I have been discussing lengthily or arguing for so strongly. Regulators should realize that the CAPM doesn’t work for non-efficient economies like ours. Similarly, it uses the Beta that supposedly represent the “market”. Unfortunately, there are not enough companies that can fully represent the market. And in the meantime, while our regulators insist on using CAPM, they should understand that their application of the model particularly of the Beta is wrong. Our ERC uses the same Beta, the measure of risk, for all power plant projects when computing for the tariff. This means that a coal-powered plant and geothermal power plant will have the same Beta. Our regulators assume that all power plant projects have the same risk profile when computing for the cost recovery in setting the tariff. This is wrong, as I have mentioned since the risk, of let us say of a geothermal power developer, will be higher than a coal power plant developer. Exploration for geothermal is more costly and hence its Beta should be higher to reflect the costs of undertaking that risk. Many of those who oppose renewable energy often argue that the renewable energy sources cannot act as a baseload plant. This is an incorrect assumption. Arguably, wind and solar cannot produce energy 24 hours a day, but a geothermal power plant can. The argument that no renewable energy source can act as a baseload plant should have been retired a long time ago. Mindanao, unfortunately, always figures in the news due to the peace and order situation and its recurring power shortage problem. Last year, discussions on the creation of a Mindanao Power Corporation, as well as privatization of the island’s power plants were lively. However, it is my belief; that government should first prioritize the opening of more power plants—both conventional and renewable energy to secure the power system on the island. We first should achieve a long-term and stable solution to the power crisis in Mindanao. Only then can we talk about privatization of the island’s power plants. Last year, former Energy Secretary Jericho Petilla came out with a circular requiring Distribution Utilities (DUs) to use a third-party entity when securing their power sales contracts. This circular caused a stir among energy players as the CSP is largely problematic. Many argued, including me, that the CSP does not protect the interest of the smaller players, and hence defeats the purpose of EPIRA to promote fair competition among the power players. This is just one of the many arguments hurled against this circular. It is then my wish for the DOE to review and reconsider this rather alarming circular. Climate Change has taken the center stage as world leaders met in France for the United Nations Climate Change Conference (COP-21) with the goal of producing an international treaty to address the effects of climate change. In the 180-page encyclical released last July, Pope Francis discussed thoroughly the effects of climate change and warned all of us of the possible consequences of our neglect on the environment. The Pope did not mince words and instead insisted that we all take notice of this problem. Why is it essential for us to take the words of the pope to heart? Aside from being good Christians, there is also a practical utility for us to address climate change. Even the pontiff expounded the effects of failure to address climate change and even offered practical solutions to the problem. WHO’s report also stressed that the Philippines as a developing country is highly vulnerable to the effects of climate change including sea-level rise, an increase in the frequency of extreme weather events and rainfall and rising temperature. The effects will result in higher incidence of infectious disease, population displacement, heat stress and frequent disruption of economic activities especially in the agricultural sector. The pope offered a solution to the problem through replacement of harmful sources of energy with renewable energy. Unfortunately, we are the perfect example a country that is abundant in renewable energy sources and yet are unable to tap these God-given resources. And a major reason for this is self-inflicted: we have put in too many regulatory barriers. Data from our Energy Department shows that we are still sourcing our energy mostly from coal and natural gas. In 2014, we have sourced 42.78% of our energy from coal and 24.19% from natural gas. On the other hand, the Philippines yet has to achieve a greater energy mix consisting of renewable energy since we only generated 13.34 percent of our energy from geothermal and 0.2 percent from solar and wind. This is unfortunate for us as we are the second largest geothermal energy producer in the world, and a tropical more fair country that experiences weather. The Philippines’ slow progress in making renewable energy can be attributed to a variety of factors, but largely because what I already said – the barriers and hurdles of implementing a project here are unimaginable. I have been vocal in saying that major reforms are needed in our regulatory framework and system planning philosophy. It is sad that a country as poor as ours are unable to produce more renewable energy for the benefit of all. When I was CEO of National Power Corporation, we were supposed to implement a renewable energy UPP program – 100 MW per year across all technologies, if I remember right. Unfortunately, it was never followed through in the subsequent administrations. My idea then was for us to learn the different RE technologies so that when the time came, we would have the resources and the people to implement them. That time has come. And we are really not prepared. There is a need for us to develop other sources of renewable energy, especially that WHO’s data showed that inefficient and polluting forms of energy are drivers of climate change that lead to air pollution. Roughly seven million people have already died due to air-pollution-related illness, making it the biggest environmental health risk. And in the Philippines, 46 percent or roughly 12,700 child deaths are caused by acute lower respiratory infection from household air pollution in 2012 alone. Given the consequences of climate change, its effects in our environment, lack of government support and failure of our leaders to make the necessary changes, it is up to us—the private sector and local communities—to find ways to develop renewable sources of energy. Even Pope Francis acknowledges the contribution of local communities in developing more environment-friendly sources of energy. Perhaps it’s time to heed the call of the Pope and be good human beings by becoming better stewards of our environment. Otherwise, future generations will be deprived of God’s gifts just as Pope Francis warned. I have built fossil fuel power plants and these plants have contributed greatly to our country’s economic progress. Times are, however, different now. The future is no longer based on fossil fuel. For the first time we are hearing one single line from world leaders: build renewable energy. Let’s roll up our sleeves and heed the Pope’s call. I remember growing up as a boy in Mindanao seeing my father getting on his green bike to go to Ateneo de Zamboanga where he was a Math and English teacher. He must have been a popular teacher because I remember the throngs of students who would come to our house for tutoring. Some of these students are still around today and still commend my father’s influence on their professional and personal lives. He might have been popular, but this popularity was derived from being tough and unrelenting on his students. My father’s passion for education, I believe, was driven by the fact that as one of the youngest in a family of 11, he was the only one who graduated with a college degree. A high school valedictorian, my father graduated from the Ateneo de Zamboanga as one of its brightest students. It was no wonder that he wanted to “give back” to his alma mater by becoming one of its teachers. He was later asked to teach at the Ateneo de Cagayan (now Xavier University) where he met my mother, Gloria, also a teacher. My father was especially tough on us, his children. He would spend nights breathing down on my neck, making sure I got the exercises by Hart (Algebra) correctly and within a defined time limit. That’s the reason I was already tackling college calculus long before my high school classmates could do algebra. Both my sisters went to the Philippine Science High School, and we all went to UP. Jesus P. Delgado was my father, an educator. My father died many years ago, penniless. Our house, a nipa one, was however the center of educational excellence. Today, I have a sister who finished law, nursing and a PhD degree in a field I can no longer remember. I have another sister who must have finished three masteral degrees in applied mathematics and who is mother to two Harvard physics graduates. My mother, who is 83 years old, took up law when she was 64 years old and became a lawyer shortly before she was 70. She has four other degrees. And while I am not in the habit of trumpeting my own achievements, let me just say today that unlike my father, I am not an educator, and I am not penniless. My father may have died penniless, but he did not die poor. He gave us what all of us must have in life: a good and proper education. In that he was a very wealthy man, a very wealthy man indeed. And this drives my passion to use my corporate vehicles, my businesses as means to support education in this country. Education is so basic that if our society cannot give that to our children, to our youth, and then that would be criminal. No one can survive these times without education. A democracy, in fact, requires that its citizenry achieve a certain level of education that will make them intellectually independent to make informed choices when choosing political leaders. Any country that fails to educate its citizens effectively relegates them to slavery and poverty. That’s why we find it deplorable to hear of countries that continue to deny education to its citizens on the basis of gender or race. The challenge of education however, goes beyond our ability to teach or to provide classrooms. It demands that we have healthy children. No, in fact, it requires that these children are kept healthy even before they are born. Their mothers must have the proper nourishment to ensure the proper nutrients are provided to the fetus. 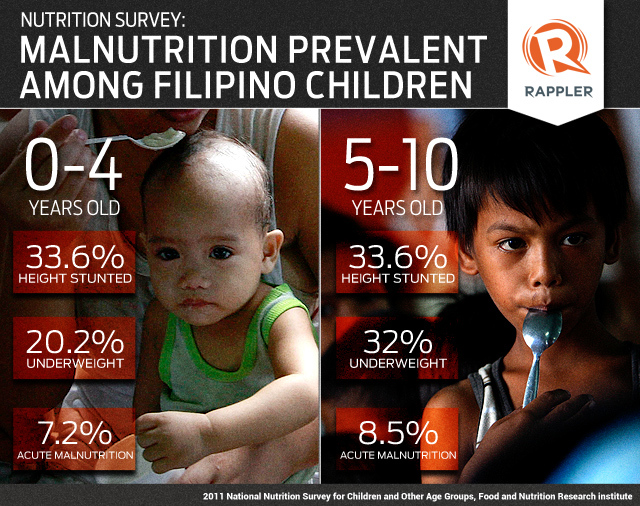 Studies have shown that more than half of Filipino children are already bound to fail to get a proper education due to malnourishment. Their learning capabilities are severely diminished as a result of their poor health. We need to have a healthy society for education to succeed. Mens sana in corpore sano: a sound mind in a sound body. Our children have lost the fight for better education, even before they started school! And here lies an even greater challenge: prosperity for all. Prosperity defined not in the number of cars we own, but defined in our ability to properly feed, bathe, educate, and raise our children in a society that respects the dignity of man and the rights of the nuclear family to be together. Sadly, we fail in many ways. It pains me when I picture a mother bathing a baby tenderly, with much love who is not hers. She is an OFW bathing the child of another mother while her own is being bathed by friends, neighbors, and relatives. This is a very painful picture. I can only imagine how our society will look down the road when the effects of broken families will begin to creep into our labor sector, our government and corporate sectors. How will a citizen who hasn’t felt the nurturing warmth of a mother’s arms or the steady hand of father guiding his children survive? This assault on the family is what we in the corporate sector should be concerned about. We all have different charities ranging from feeding the street children to providing roofs for the homeless. I believe however, that the simpler strategy is for all of us to focus in protecting our traditional, nuclear family. The family should have the ability to feed, clothe, and provide basic education to their children. The children must not be deprived the warm bosom of their mother and the steady, guiding hand of their father. Husbands and wives must be given the chance to freely express their love without the burden of having to define motherhood in terms of pesos and centavos. Such definition is demeaning for our citizens, for our society. The state fails when it has to intervene into how a family should express love and practice their faith in order to keep economic and social order. The state exists for me and not the other way around. Common good defines that the state’s need should be subordinate to that of its citizens. Corporate citizenship for me, therefore, should be about providing opportunities for the family as a whole. For me, it is about encouraging and supporting opportunities for entrepreneurship, education, protection and enhancement of God’s gift of nature to us. We have seen how corporate greed has destroyed homes, families, all over the world. A secular world devoid of family values has made financial disasters happen. We must reverse all these. We must work hard to make our economy so vibrant that we do not have to ask our fathers and mothers to leave for abroad to work. We must work hard to make this nation of entrepreneurs who create value for the society through creativity and innovation. We must work hard to create an economy that uses God’s gift to the enhancement of humanity’s survival with dignity.